My Refined Style – One Year Anniversary Celebration! Welcome to the one year anniversary of the My Refined Style, our special 40+ style blogger monthly link up party! This look incorporates some of my very favorite things. First of all, I love flare jeans. I think they’re super flattering! My fav thing to pair with a flare jean is a fierce pair of boots. Nothing makes me feel quite as confident as taking on the world in a pair of badass boots! 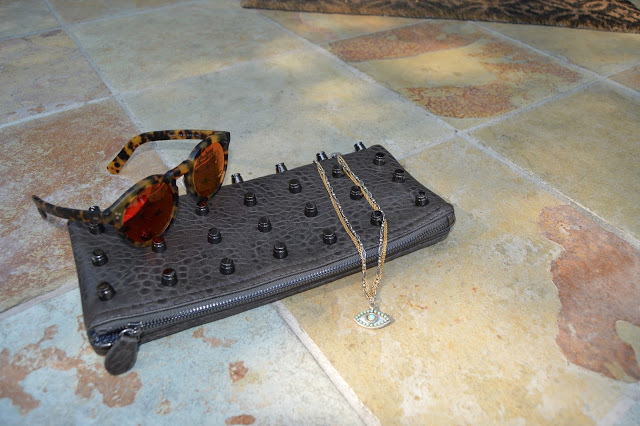 My favorite accessories have a bit of edge to them, like these red mirror sunglasses, this studded clutch, and my Michal Golan evil eye necklace. I also added in some black chokers, which are on trend right now. How to describe my signature style? Hmm … modern casual, with a touch of rock & roll gypsy? Have fun & be fab! This month, the My Refined Style Linkup celebrates our one-year anniversary! We wanted to do a little something special, so we are each sharing the elements that refine and define our own personal styles! We are also happy to welcome a new host, Trina from Tea Time With Trina. I am a major fan of black, not because it’s easy, but because it’s honestly one of my most flattering colors. I prefer classic lines, but I like to mix things up with interesting textures and details. Then, I like to add just a touch of edginess to my outfits to keep things fresh and current. Here is an outfit that best describes my personal style. I love color, and feminine styles. The shape of this dress is fitted, I love a vintage inspired look with the color and v back. Dressing for my shape is part of my style as well as wearing shoes that are comfortable and stylish. The block heel, vintage inspired, is a versatile shoe! I do love my floral patterns as well! I think this look reflects my personal style. Here I’m wearing all my favorite things: flared jeans, cool shades, and kick a** boots! I’m also loving revisiting the deep burgundy lipstick shades and black chokers of the 90’s! Here is a recent picture that I thinks expresses features of My Refined Style. I like to mix dressy with casual, have a fun and funky piece as the eye-catcher, and use jewelry to help define the look. I always want my shoes to have a little personality, like these black booties. And I like to incorporate trends (e.g., cropped trousers) with classic silhouettes. This particular outfit I saw on Zara’s website and just knew I had to have it. It was just so different, but yet so elegant and sophisticated. I love to be comfortable in what I wear so this was right up my alley. Pairing it with metallic slippers or slides seemed to be the perfect mix. Casual elegance. I have a difficult time defining my style, but people have described it to me as just that, casual elegance. This look captures and defines my style which is often a blend of dressy with a casual piece mixed in or visa versa. There is something about mixing casual and more dressy pieces and soft fabrics that makes me feel polished yet more comfortable. For me, being refined means wearing things you love but always feeling like yourself and exuding confidence. This bohemian style dress, which I’ve layered over a peasant blouse, and paired with lace up flats definitely defines my everyday style. 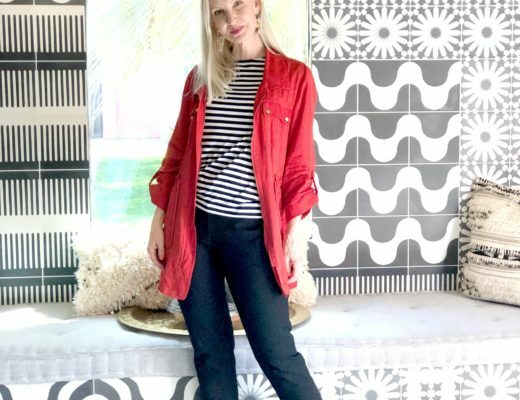 I’m not afraid to layer, I feel comfortable running around in flats (even at my wonderful height of 5’3″) I am more likely to throw on a dress on any given day for just about any given occasion because it makes me happy! I feel truly confident in this little number and just a bit unique which is what makes us all that much more refined. You are the epitome of fierce, chic style!!! LOVE this and I've got some serious boot swoon!! 😉 Pleasure co-hosting with you darling friend!! Thanks for the link up & happy almost long weekend! Love this look! Super chic- and the evil eye necklace is a stunner! Dawn Lucy, you look so hot in this outfit! I am loving every bit of it! The flares, the boots, the choker…and I always love a gorgeous Michal Golan piece! Fabulous! Love this look – especially your studded clutch 🙂 You wear flared jeans so well. This is such a chic boho look! Those flares look amazing on you! I actually have my flares on today—first pair in forever! I'm still getting used to the different silhouette, so I'm happy to see others styling their flares in order to get some ideas!! Thanks for this you hot mama you! Thanks for linking up to Top of the World Style. This look is perfect from head to toe including the clutch! Love this, such long legs! I just bought 2 pairs of flares, love the style on you with those hot boots!